GamePlay: This point and click game installs from 3 CDs. CD3 is needed in the drive for gameplay. After installation there is a choice of Player 1-5. The main menu consists of new game, resume game, load game, options (video acceleration, color, speed. volume and subtitles), documentary database, credits, Victory Diary (seen at end of game) and exit. This walkthrough is played with version 1.0.0. Right click of mouse opens the inventory bar that has the items picked up on the left wing and the spells on the right. At the center, the lens (examine objects or spells), box (goals), scroll (documentary database) and exit are located. Right click again to remove the inventory bar to facilitate action on gameplay. There are unlimited save spaces. Pressing the spacebar skips the intro and cutscenes. During gameplay, right click of mouse skips dialogue. Be sure to -- Exhaust all dialogues. The timed puzzles allow a restart of the puzzle when unsuccessful. High Priest Khaemouaset, son of Ramses writes that the Pharaoh, Ramses II at his sixtieth year asks Amun Re to prolong his life. Amun Re will give him up to his 80th year if he raises a giant Obelisk to the glory of Amun Re before the season of Shemu or else he will die. Only Paser, the great architect is capable of raising the Obelisk. Pharaoh sends Maya, a young magician to conduct an investigation of some strange accidents that are occurring on the worksite. The monument will be put up within the walls of the Temple of Pi-Ramses. Temple: In inventory, Pharaoh's seal and Wadjet-eye of clairvoyance are already found. Turn left, forward, left and talk to Djer, supervisor of construction. Show him the pharaoh's seal. Paser's house is the one with the decorated lintel. Turn right and exit through the entryway. In the left part of the courtyard is the boatman that takes Maya through her travels on the Nile. To far right, the brick makers are working. Go through the entryway left of the brick makers and enter the door with decorated lintel and a water jug. Paser's house: Look around and then go through the second door. Talk to a very sick Paser and exhaust all dialogues. Go to the next room, the workshop and look at the small statue of Imhotep, father of architects on the workbench. Go to right end of the workbench and pick up the torch. Exit the courtyard. Talk to the brick maker and exhaust all dialogue. Show him the pharaoh's seal also. The brick maker tells of his dreams. Temple: Go through the entryway to the right of the brick makers and right again to enter the temple. Turn left and go to the far column and pick up a piece of cartouche. Go forward to the next room, turn right to the next room and forward to the naos, the heart of the temple. Click on the space on the left frame - there's a cartouche missing. Study the other 3 cartouches. Turn left to the wall and click on it to sense a secret passage behind the wall. Go out of the room, forward to end and talk again to Djer, the foreman. He gives you the second piece of cartouche he found. Talk to him again and exhaust all dialogues. Turn right and exit the temple. Brick maker: Give the 2 pieces of cartouche to the brick maker and he gives the glued mysterious cartouche. Temple: Go back to the naos by going through the entryway on the right and right to temple. Turn left, go to next room and right to next room. Turn left to the naos. Insert the mysterious cartouche on the empty space on left frame of the naos. This opens the secret passage. Click on mysterious cartouche and see that it can not be removed. Light the torch on the fire stand to get flaming torch. Enter the secret passage. Secret Room: Maya is locked in. Pick up the Amun Re cartouche on the floor at opposite wall. Turn left and move the loose tile on the floor by wall. Pick up the foundation deposits. A vision of broken obelisk, drought, Paser and the Pharaoh dying occurs. Go to the left of the sealed entryway and look close at the etched hieroglyphs. Hieroglyph puzzle - The object of the puzzle is to arrange the slider puzzle to show the cartouche of Ramses II. Open inventory and select the scroll (documentary database) and see the right cartouche that is the finished product of the puzzle. 1. Use the Pharaoh seal on the oval at bottom of puzzle to activate the puzzle. 2. The bottom left base moves the left column down. The right bottom base moves the middle and right columns down. The top right cobra eye moves the 3 columns right and the top left cobra eye moves the 3 columns to the left. 3. Pull back out of the puzzle to reset the puzzle. Right click to remove the inventory bar. 4. One possible solution: Click bottom right 5xs to get left and right columns to match. Click top left eye once to move the middle column to the left. Click bottom left base 4xs to position left column. Click bottom right once. The door opens. Paser: Go back to Paser. On the way the torch goes out - that's okay, we don't need it anymore. Show Paser the foundation deposits. Talk to him completely 2xs. You need to remove the mysterious cartouche that opened the secret room. Paser gives you the Purification vase spell to cleanse the temple. 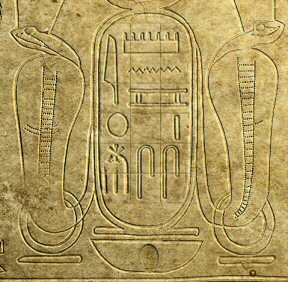 You must replace the mysterious cartouche with the Amun Re cartouche. Naos: Use the purification vase on the mysterious cartouche. It disappears. Place the Amun Re cartouche on the space and the secret passage is closed. Paser: Talk to Paser. He wants Maya to bring the documents for raising of the Obelisk to his assistant Ouni at Aswan Quarry. Paser gives a black stone to use at the statue of Imhotep. Paser loses consciousness. Go to next room, look close at statue on the workbench and use the black stone on the statue. Take Quarry documents. Go out of the courtyard, turn right and talk to boat man by exit. Time to go to Aswan Quarry. Yard: Go forward, turn right and go across the yard area. By the left house of the 2 houses there, look down and take the 'What's this' dried donkey droppings. The things we do in adventure games! Turn left and talk to Ouni, the man sitting in front of the house. Give him the quarry documents. The tools are not solid enough. Go forward once behind sneezing Ouni to the canopy. Look down, turn around and take the only active dolerite ball. Then take it again from inventory and click it on the granite stone beside the black balls. Pick up the damaged dolerite ball. Talk to Ouni again. The dolerite papyrus is missing in his house. He gives permission for you to look for it and meet Tuya, his wife the great healer. Ouni's house: Turn right and enter the house. The first room has a bitter apple in a basket. Go to next room, a see a bit of ochre by the standing fire lamp. At one end of the worktable are remedy recipes. Note the snake bite remedy. Go to next room and the room after that. Tuya's test: Meet Tuya at the courtyard. Tuya needs proof that Maya can do the remedy for Paser. Maya has to do the transfer spell, a linen handkerchief that can transfer an illness from a man to another man or animal. Go out and click the handkerchief on sneezing Ouni and then click on the donkey on the left. Go back to Tuya. Talk to Tuya again. She gives a cobra of hypnosis for the hypnotize spell. She gives permission to look for the dolerite papyrus. To the left of Tuya, there is some gum and a knife. By the door is a jar. Go to the door right of the oven. Left of the closed door is some terebinth. Now you know where all the ingredients for snake bite remedy are. Storeroom: Enter the room and open the basket on the floor on the left. Maya is bitten by the cobra. There is a papyrus at the bottom of the basket. Go outside and see that Tuya is gone. Remedy preparation - Dried donkey droppings, gum, ocher, dried terebinth, piece of a broken jar and bitter apple seeds. Pulverize and drink. Collect the ingredients. You already have the dried donkey droppings. Take some terebinth from left of the storeroom door. Go to where Tuya was sitting and take gum and knife. Go to the door and use the dolerite ball in inventory on jar. Right click to place the ball in inventory. Right click again to close inventory. Take piece of jar. Go to workroom and take ochre from base of standing fire lamp. Go to front room and use knife on bitter apple. Right click to place the knife in inventory. Right click again to close inventory. Take bitter apple seeds. Go back to where Tuya was sitting. Place all the ingredients in the mortar. Take the pestle and then use it on the ingredient full mortar. Watch Maya drink the remedy. Take the dolerite papyrus from the cobra basket. Go outside and talk to Ouni. Ouni reads the papyrus and says that the God of Forge, Ptah alone can help us. You need to talk to Khaemouaset in Memphis. Ouni gives dried snake for protection from further snake bites. Talk to the sitting boat man at entrance to this place. Talk to the Guard in front of the chapel. No one passes here! Oh yeah! We need his name. Meet the basket weaver at the pond: Turn around and go through the entryway. Take the right side of the pond. Take the pebbles from the ground midway of the length of the pond. Talk to the ornery basket weaver. He keeps shooing you off. Look down and see something in the basket by your foot. Hmmm. Still close to the basket weaver, pan left and use the pebbles on the hotspot left of the pond step. Fish, eh! Immediately take the item from the basket by your foot. It is an ostracon. Talk to basket weaver again. Give him the ostracon and he tells you the name of the guard is Pamose. Enter the Chapel: Go back to the guard and use the snake hypnosis spell. Talk to guard again and then show him anything, I mean anything from your inventory. Turn right and click close to the standing lamp. Khaemouaset, High Priest of Ptah comes near. Give him the dolerite papyrus. Talk to Khaemouaset using all dialogues. Harmful presence in Ptah's temple: Turn right and open cabinet. Use the Wadjet eye of clairvoyance on the crack. Use knife on crack and take the dried scorpion. Khaemouaset gives you the banner for controlling the wind. Take the key from the central table. Use key on coffer on the floor beside the open cabinet. 6. Gold. 5. Silver. 4. Ebony. 3. Ivory. 2. Juniper wood. 1. Copper. 1. Turn rod only - counterclockwise (bottom turn arrow) once. 2. Insert rod to #2 Juniper wood wheel ONLY. Turn #2 juniper 2xs any direction. 3. Insert rod to #6 Gold wheel. Turn #6 Gold wheel until the green button appears. It is done. 4. Pull rod to #5 Silver wheel. Turn #5 silver wheel clockwise (top turn arrow) once. 5. Pull rod to #1 Copper wheel. Turn #1 copper wheel clockwise (top turn arrow) once. 6. Insert rod to #2 Juniper wheel. Turn #2 Juniper wheel counterclockwise (bottom turn arrow) once. 7. Insert rod to #5 Silver wheel. Turn #5 Silver wheel until the green button appears. It is done. 8. Pull rod to #4 Ebony wheel. Turn #4 Ebony wheel until the green button appears. It is done. 9. Pull rod to #3 Ivory wheel. Turn #3 Ivory wheel until the green button appears. It is done. 10. Pull rod to #2 Juniper wood wheel. Turn #2 Juniper wood wheel until the green button appears. It is done. 11. Pull rod to #1 Copper wheel. Turn #1 Copper wheel until the green button appears. It is done. Take the Kyphi - perfume. Give the perfume to Khaemouaset. The perfume is incomplete. Khaemouaset needs fragrant rush. Gouge the for basket weaver: Go to the pond area across the chapel. Talk to the basket weaver about fragrant rush. He wants you get his gouge which he threw at a fish and is now on top of a lily pad at center of pond. (This part can be done the first time you arrive here at the pond). Go to water reservoir entrance across the pond. Take the rope. Go to bird on top of right wall close to entrance. Take pebbles from ground in front of bird or there are pebbles by the trees across the pond. Throw the pebbles on bird. Take the piece of copper the bird dislodged. The rope and hook are combined automatically to make a grappling hook. While standing close to the constantly shooing basket weaver, pan left move cursor to closest lily pad. Use the grappling hook on lily pad. Maya pulls the lily pad. Pick up the gouge and give it to the basket weaver. He gives you the fragrant rush as well as water lily seeds. First section of lava floor: Go forward to the raised stone. Look down at the active site of the lava lake and then turn right to see the anvil rock. Turn left and click close to the far wall. Take the pincers on lava floor. Turn around and enter the cave. Sakhmet's hall: Look close at Sakhmet's statue at center of room. Note that a piece of Sakhmet's key of life she is holding is missing. Pan down at canoptic jar with head of Thot. Use the pincer on canoptic jar to unstuck the head of the jar. Click the jar to turn the head to the right. Go outside and see that you are not at a different area. Go back inside the hall and see that ALL the entrance leads to the same area of lava floor. Exit the hall. Dwarf section of lava floor: Talk to dwarf. To see Ptah, you have to have a sistrum and then to extol him with singing. You have to make a sistrum. Look behind and above the dwarf and see a rope too short for the dwarf. Third section of lava floor: Enter the cave again, turn the canoptic head to the back and then exit the room again. Look around and pick up bronze strip and handle. Fourth section: Go back to the cave and turn the jar to the left. Exit the cave to the fourth section of the lava floor. Take the mallet by the rope. Use the knife to cut the rope by the wall. Make a sistrum: Enter cave, turn the jar to face front and exit the room. Go to anvil rock. Heat the bronze strip on lava pool. 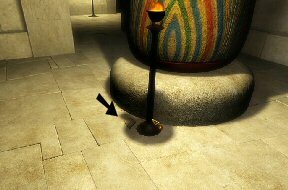 Place the heated bronze strip on anvil rock. Use mallet on heated bronze strip. Place the handle on U-shaped bronze strip. Now, we need metal rods to make the sistrum musical. Dwarf section of lava floor: Enter cave, turn jar head to the right and exit the room. Talk to dwarf about bronze rods. He wants help about his rope. Click the rope from inventory to rope behind the dwarf. Talk to dwarf again, he gives the rods for the sistrum and tells you how to invoke Ptah. First section of lava floor: Enter cave, turn the jar to face front and exit the room. Stand by anvil rock and watch Maya invoke Ptah. Ptah comes: Talk to Ptah completely. Bring me a ball of magical dolerite. Go to Hall of Sakhmet and open passage 3 times. To open the first passage, a metal worker has the die for key. The magical ball is light, airy elusive but above the circle it corresponds, it becomes hard. First passage: Enter Sakhmet's hall and turn the jar head to the right. Exit the hall and talk to the dwarf about the key. He gives the empty mold. Enter Sakhmet's hall and turn the jar head to front. Exit the hall and talk to Ptah about finding the key. Life will open the way to you. Place the empty mold on lava pool and the place it on the anvil rock. Take the cooled lava object. Go back to Sakhmet's hall. Click the lava object on Sakhmet's key. Something moved. Turn left and look close at alcove. Click on staff to lower it. Go outside to check it out. Second Passage: Enter an identical Sakhmet's hall. Go around the hall and look at 4 alcoves with drawings, lit by lamps. Use the eye to see the 4 goddesses defending Osiris. Go back to Sakhmet's statue. Look down at the base and see a square area. The slab in front of the base could collapse. Place the damaged dolerite ball on slab. This opens the square base. Take the 4 Goddesses balls. Facing Sakhmet's statue, place the Bastet ball at bottom left alcove (sitting god), Sakhmet ball at top left alcove (standing god), Wadjet ball at top right alcove (snake god) and Sechemtet ball at bottom right alcove (scorpion lying down god). Something outside moved. Exit. Third Passage: Enter another identical Sakhmet's hall. Talk to Sakhmet. Answer the question: What did Ptah accomplish with his heart and tongue? He created... the world. Music reproduction puzzle - Now, Sakhmet makes music that you must reproduce to open the room to the dolerite tools. There are 3 different sounds mixed together: a wop-wop sound, metallic sound and hissing sound. Move to stop the music and look around the room. See 3 alcoves with dripping water. Each of the water drips at different speed. Now we need to produce the 3 sounds based on the speed and item placed to make music when the water drips on it. Facing Sakhmet's statue, place water lily seeds on lower left alcove. This produces a water lily leaf that produces the wop wop fast and lower sound. Place the sistrum at top left alcove and this produces a metallic sound. Face Sakhmet's statue and see a dish by her feet. Use the purification vase on the dish to get a bowl of lava. Place the bowl of lava at top right alcove to produce the hissing sound. The door to the dolerite tools is now opened. Dolerite Tools Room: See an altar with a square, round and triangle dolerites at the center of the lava pool. On each side of the room is a stand that has geometric shapes on them. Magical ball recovery puzzle - The object of the puzzle as Ptah stated is to place the round dolerite over the stand with the circle to make the light, airy ball hard. Since it is light, wind can move the object on the altar. 1. Standing in front of the square stand with the exit behind, use the banner spell on the ball at center of altar. It will float above the triangle post. 2. Standing in front of the circle stand use the banner spell on square dolerite to move it to the center of altar. 3. Standing by triangle stand, use banner spell on square dolerite to move it to square stand by exit. 4. Standing in front of circle stand, use banner spell on triangle dolerite to move it to square stand on opposite wall. 5. Standing in front of triangle stand, use banner spell on round dolerite to move it to altar. 6. Standing in front of square stand with triangle dolerite above it, use banner spell on round dolerite to move it to circle stand. Take the magical dolerite ball. Now you can return to Ptah. Exit the room and come out to the lava floor. Talk to Ptah. He will have dolerite balls made available to the workers to make the obelisk. Return the ball to where it came from in order to get back to Maya's world. Ptah gives a bee of magic wax. Drop the magical dolerite ball at lava pool. Talk to Khaemouaset. Exit the chapel and talk to the boatman. Talk to Ouni. Go to Ouni's house and talk to Tuya. After she asks, give Tuya the dried scorpion taken from Ptah's chapel. Paser's remedy preparation - Copy the healing formula using red ink on a blank papyrus. Go to other end of worktable. Take a blank papyrus from the rolls, left of the large vase holding scrolls on the worktable. Look close at formula. Place the blank papyrus on empty space below the formula. Take the calamus and dip it in red ink. Click the calamus with ink on the blank papyrus. Give the healing formula to Tuya. Tuya places the formula inside an unfired figurine. Now, you need to fire the figurine. Take the lighter beside Tuya. Go to the kiln at the open air room where Tuya was before. Pick up the twigs at the base of the tree. Place the twigs at base of kiln. Use lighter on twigs. Place figurine on top of kiln. Take fired Paser figurine. Go to where Tuya was, enter through the door on the left and take the mat. Go outside and talk to Ouni. The floods of the Nile still have not come. An evil fire is burning beside the obelisk. Turn left and go to the quarry through the open area between the houses and the rocks. Go forward and pick up the jar of water. Go to the pile of lumber at left end of the ditch. Pick up the stick from the ground. Go to the fire. Place the mat over the fire. Look close and see a strange object buried in the hot ground. Click on right side of mat to take the mat off the cinders. Use the stick to take the mysterious knife with immense power - must belong to a God. The stick becomes charred stick. Turn around and talk to sniffing Ouni about the floods of the Nile. Exit the quarry and see a cutscene with the Gods. Nice to have all your earthshaking decisions solved by the Gods. Talk to the boatman at entrance to the village. Talk to the guard and he says that Khaemouaset is not here. Turn around and go to the pond area. Take the right side of the pond and pick up the long stick by first tree. Take the plate by the jugs at the last tree. Talk to the basket weaver. Go to the water reservoir entrance and talk to the young girl. To restore the floods, bring back the recipient of Isis to the young girl. Go to the nilometer (the round structure). Look close at the top of the structure (coping) and see a bas-relief. Place blank papyrus over the bas-relief. Use the charred stick on blank papyrus. Take the tracing of the design to be completed. Talk to the basket weaver. Give the tracing of the design to be completed and give it to the irritating, constantly shooing basket weaver. He needs an egg as binder. Turn around and go to the left wall of the gate. Look at the nest below the bird. Place the plate on the ground. Use the stick on the nest. Take the smashed egg. Give the smashed egg to basket weaver. Give the calamus to him also. The finished drawing is in inventory. Give the finished drawing to the mysterious young girl. Now we need to set the drawing on the coping. Go to the nilometer and place the finished drawing over the bas-relief on the coping. Click on the sparkle seen. Take the sacred recipient of Isis. Give the scared recipient to the girl goddess. Watch the cutscene. Talk to Isis. Pass through the Gates of Death. Only Osiris can help restore the floods. Isis gives a magic net. Turn right and go to the end of this isle where the water lilies are blooming. Drop water lily seeds on the water. Click on other side. First Test: Go to the altar. Object of the puzzle is to move the 3 god stones from this altar to the altar at next island. You can carry one god stone only at a time. Nut must not be left alone with Geb and Shu should not be alone with Nut. 1. Take Nut, the top stone. Turn left and leave Nut at next island's altar. 2. Come back to first island and take Shu, middle stone. 3. Go to next island. Leave Shu and take Nut. 4. Go to first island. Leave Nut and take Geb. 5. Go to next island. Leave Geb. Take nothing. 6. Go to first island. Take Nut. 7. Go to next island and complete the puzzle by leaving Nut with the other Gods. Go to the island at left before the bridge and take some rocks (there are some more rocks at another island later). Cross the bridge. Second Test: Talk to Isis on the rightmost island. Object of the puzzle is to guide Horus, the falcon and Set, here depicted as the tortoise to the middle island of 5 islands. 1. Counting the island from L-R, as 1-5. Leave the 5th island you are standing on while talking to non-stop wing flapping Isis. 2. Go to fourth island where the tortoise is nearby. The tortoise moves to second island. 3. Go to first island on the left and move the hovering hawk to the middle island. 4. Go to second island to move the tortoise to the fifth island. 5. Go to fifth island to move tortoise to the middle island. The hawk and the tortoise are now by the middle island. Cross the middle island, over the tortoise to the next island. Next Island: Isis is not around. Go to the water collection set up on the left of the island. In front of it is a ditch to carry water to an empty reservoir at other end of the island. If you have not picked up rocks from the other island, there are rocks at top right of the island. Check the rope dipped in the water - the gourd filled with water is heavy. Place rocks on the counterweight hanging basket. Click the gourd rope and watch Maya pour water on ditch to fill the reservoir. The water formed into a gate. First guardian - Guess the name of the guardian of the first door. Object of the puzzle is to make a depiction of the guardian of the first door as seen within the first door. The altar has 6 tablets that you can cycle through different parts of the depiction. Cycle through to select the parts similar to the guardian. 1. Activate the stone puzzle by using the bee of the magical wax on etched bee. 2. Back out to reset the puzzle. The 6 stones are L-R: neg eb ess ou et a. 3. From L-R: Press #1 stone once, #6 stone once and press #4 stone once - Negaou. Second Guardian (The Double Test): To get to the second guardian, cross a labyrinth. Object of the puzzle is to cross the labyrinth while guiding your Ka counterpart and reach the exit at top of maze at the same time. The Ka's maze is the mirror image of your maze. The maze has blocked slabs that can stop you or the Ka while the other takes other steps. Check the description of The Double Test by clicking on the question mark icon. You and the Ka must reach the top exit at the same time. Number the slabs 1- 4 across starting at row closest to start area going 4 rows up to 13-16. Step on 2 - 1 - 5. Step on 9 - 13 - 9 - 5 - 1 while Ka is blocked at the mirror maze. Step on 2 - 3 - 7. Forward-click twice on the void to move the Ka at the mirror maze while you are blocked. Step on 8 while Ka is blocked at mirror maze. Step on 4 - 3 - 7. Step on 8 - 12 - 16 while Ka is blocked at mirror maze. Step on 15 and out to the mat. The small guard hath a heart of stone. The transparent guard is to the right of the small guard. The papyrus heart is to the right of the heart of gold. The heart of gold is to the right of the heart of stone. The lapis lazuli heart is between the stone one and the golden one. Find the guard with the heart of feathers and thou shalt pass. The object of the puzzle is to find the guard with the feather heart. Based on the clues given, the gold, lapis lazuli and papyrus guards are to the right of the small stone guard. Since the small stone guard is the second from the left, the guard with the feather heart is the first one. Click on the first guard on extreme left. Final Trial: See 4 mats with depictions of the Constellation of 4 Gods. Step on any the 2 front mats. Look up at the constellation formed in the sky and look at the dots on the God constellations depicted on the mats. Step on the map constellation that matches the sky constellation. Remember that the 2 even stars constellation is the Horus depiction and the 2 uneven stars constellation is the bull depiction. Osiris: Go forward and talk to Osiris twice. The enemy gave himself away. Give the mysterious knife to Osiris. Set the Red is the enemy. Follow Osiris' instruction. Salty beverage, hmmm. Osiris gives Maya the kyphi, spellbinding incense (soporific incense). Turn left and place the dried snake on the burned area. Climb the steps to the young girl goddess at Memphis. Talk to the young girl goddess twice. She gives the sacred recipient back to Maya. Chapel: Go to the chapel to see Khaemouaset. Here we go again - the guard would not let you through. Hypnotize him again with the cobra of hypnosis. Talk to Khaemouaset. Give the sacred recipient and salt to Khaemouaset. Watch the meeting of 2 Gods - Ptah and Set. Talk to Khaemouaset again. Go to boatman to take Maya back to Pi-Ramses. Go forward and left to talk to Djer. Enter Paser's house. Use the figurine on him Eek! You released evil forces. A guard and Tuya arrest Maya. Tuya is a traitor!! Escape: Place the soporific incense on the standing lamp above Paser's mat. Exit the house and Maya gets a vision of the disaster if Maya fails. Go to the exit and talk to Djer. Practice the spells: Exit, turn right and right again through the entryway. Talk to Khaemouaset. Tuya is the tool of Set. He gives a rain spell. Practice the spells in preparation for the upcoming battle with Tuya. See graph below at Chapter 9. Go to the right entrance to the temple. Talk to the dreamer-brick maker to enter the temple. Tuya is in the naos and wants to be alone. Take the dream test. Dream Test - These are the answers to the Dream test. 1. The beginning of your dream indicates that in 3 summers, the harvest will be particularly good. 2. You will lose your parents. 3. You will have the support of the gods and because of that, you will rise above common folk. 4. You will live an honest life. 5. You will gain authority over people. Talk to the dreamer-brick maker again. He gives you a magic coffer he found. He heard a voice to whom to give it to. The coffer is to pick up the ferment of uncleanliness from the sacred stone. Be careful walking through the temple to go to the naos. Move one step into the temple and wait. Wait for the sitting guard on the left to turn his head to the center aisle and down - he falls asleep. At the same time, the guard on the right should be picking up something from his right and will be in the act of moving back to face the column. Also at the same time, the guard by the top right column should move away. Then click, to go forward. Go forward to the naos and see Tuya waiting for you. Tuya immediately starts the duel. Listen to what spell she uses. Take the spell to counteract it from inventory and use it on Tuya. The life force of each combatant is seen on either side of the screen. If you lose, there is always an automatic restart - so don't worry. Burn - I obey magic, burn leave nothing but ashes. Hypnosis - May the fire of the goddess Nehkbet turn you into stone. Dead souls - Come ye dead souls, come unto this place ye know not. Ka - May the shadow of your ka be surrounded and turn to stones. Lotus transformation - I am the lotus nourished by the sun and inhaled by the nose of Re. Magic Net - Attendants of the cords, bind my enemy. When successful in defeating Tuya, Tuya changes into a snake. Follow the snake to the naos. Click the ? icon to read the rules of the game. Maya or Tuya can move or cast a spell. Maya can move and cast a spell on all directions. The snake can move only on each side but not backwards. The snake can cast spell on all directions. Each square can be bewitched: Blue for Maya and red for the snake. The opponents square can be neutralized and immune to spells for one turn. Maya dies on red square but the snake loses only a segment of its body when it lands on a blue square - so it has more chances of progressing in the game but Maya has only one chance. Left click to move and right click to cast a spell. Click on lower top icon to restart puzzle. My strategy was: Constantly have one square separating Maya and the snake. Make a lot of blue squares. Move close and try to cut of segments of the snake body while on the snake's side or diagonal to hit the head. Good luck and happy snake cutting! Step by step solution by John W. Thank you!! L means click the left mouse button to move. R means click the right mouse button to cast spell. Start at 1C. Instructions below read from left to right. After defeating Tuya, the snake and placing her in the now magic closed coffer, go to Paser through the main temple. Hear hubbub and see that the temple is deserted. Exit on the side entryway. Talk to Djer standing by Paser's courtyard. The workers went to the river to see the obelisk. The guards left. Paser's house: Use the Wadjet eye of clairvoyance on the figurine. Use the mysterious knife of Set on the figurine. It has the dried scorpion. Paser is cured. Keep Paser updated. The Obelisk was erected in time. Ramses II was given life. Maya became one of the greatest magician Egypt has ever known.